The Heir was one of the books I was most looking forward to this month. It is the first in a follow up series to Keira Cass’s dystopian Selection trilogy, which I loved. The protagonist of The Heir is Maxon and America’s daughter, Eadlyn. It deals with the aftermath of the Selection series and shows how the world has changed as a result of Maxon and America’s work. I enjoyed reading from Eadlyn’s point of view. She is well-meaning but ultimately rather young and spoiled – which means there’s great scope for character development, something Cass does particularly well. My biggest issue with the book is the premise. Apparently, the caste system of The Selection has been abolished, with not complete success, yet the Royal Family remains and lives in luxury? For me that did not make sense and seemed to be contrived simply to allow the new Selection plotline. I could never quite get my head around that so gave the book four stars out of five. A Court of Thorns and Roses was another of the books I was most looking forward to this month. It is Sarah J. Maas’s (she of Throne of Glass fame) retelling of the Beauty and the Beast fairytale. It tells the story of Feyre and her dealings with the Fae. 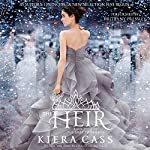 Like Beauty of the fairytale, Feyre must travel to a mysterious new castle in order to save her family; she is unaware of the ulterior motive behind her invitation – to help break the curse under which the manor’s Fae inhabitants live. As is to be expected with Sarah J. Maas, the characters are well developed, the adaptation from the source material – and the deviations from it – are beautifully written and the plot moves along at a brisk pace. All in all, I enjoyed the story very much and will certainly check out the sequel. 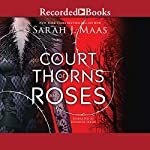 I gave A Court of Thorns and Roses four stars out of five. 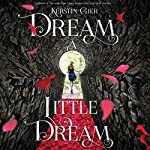 I absolutely adored Kerstin Gier’s Ruby Red trilogy – it’s one of my favourites – so I’d been looking forward to checking out Dream a Little Dream, the first book in her new series. I have to say I was a little disappointed. It actually took me two or three attempts to get into this book. It tells the story of Liv Silver and her dream connection with some of her fellow students. Liv is a fun character, but she’s no Gwendolyn Shepherd. I missed her snarky wit. The book was translated from the German by the same translator as the Ruby Red trilogy so it wasn’t a case of different choices in translation. For me personally, the dream storyline was not as engaging or interesting as the time travel one of the earlier trilogy. It wasn’t a bad book, but I think I’m probably unlikely to pick up the sequel. I gave Dream a Little Dream three stars out of five. 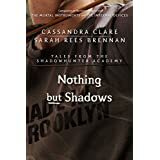 Nothing But Shadows is the fourth book in the ebook novellas set in the world of the Mortal Instruments following Simon Lewis as he trains to become a Shadowhunter. I’ve really been enjoying these books and the glimpses they give into Clare’s world. They ease the wait until Lady Midnight, the first in the new series. These novellas are quick reads and are a lot of fun. This one deals with Will Herondale’s son, and inspired me to reread Clockwork Angel again. I gave Nothing But Shadows four stars out of five. A Natural History of Dragons has been in my library for some while, but I’d not got around to reading it. That changed when I realised recently that the audiobooks are narrated by one of my favourite narrators, Kate Reading, and that my local library had the audiobook available. Fairly quickly after starting to listen to it, I knew this was going to be a favourite, especially in audiobook format, so I invested in the audiobooks of the rest of the series. The book is set in an alternative Victorian style universe in which wild dragons exist. The story is told in the form of a memoir, with the older Isabella Trent relating the adventures of her younger years. Isabella is a young woman of good breeding who must somehow align her passion for dragons with the social mores of the Victorian-style society in which she lives. Think Jane Austen meets Smaug. 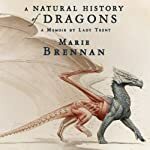 I’m also enjoying the underlying mystery of why the local dragons have become much more aggressive to humans, and of course the audio narration is superb. Check out a sample. I’ve not quite finished the book yet, but I’m sure it will receive a top rating. There is only one book in my upcoming releases for June – that is Mark Lawrence’s The Liar’s Key. This is the second book in his Red Queen’s War series, and is set in the same world as – and runs concurrently with – his Broken Empire Trilogy. I love Lawrence’s world building and I’m keen to see where he goes next. I preordered The Liar’s Key in Kindle format.